Pontoon Boat Cajun Bayou Tour |Tours by Isabelle | You'll Love Louisiana! Meandering along in a Pontoon Boat on a Cajun Bayou! This is a four-hour Private Tour. Please call 1-888-223 2093 or email us for pricing and availability. 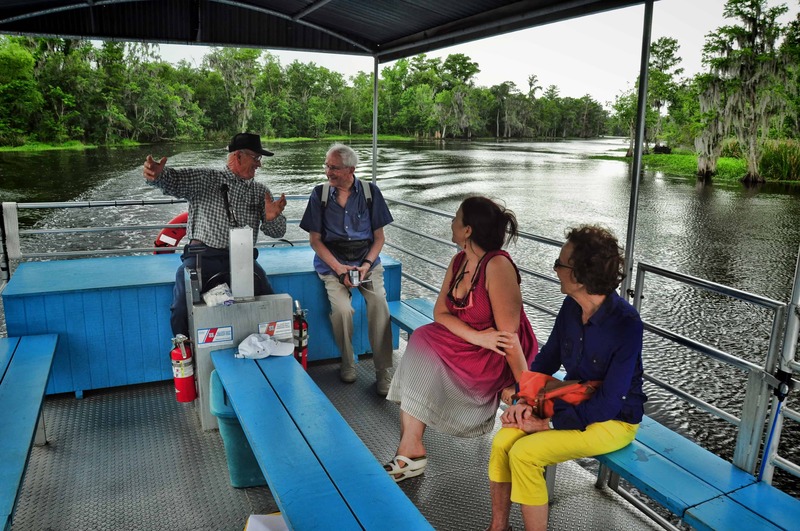 Book this tour as part of a Combination Pontoon Boat Cajun Bayou and Two Plantations Tour here. We will pick you up in one of our roomy and comfortable 14 passenger tour vans. Next, sit back and enjoy your narrated, 90-minute drive out to Cajun Country! You will pass through wild cypress swamps and cross the Mississippi River on an impressive suspension bridge. Then you’ll view vast expanses of sugarcane fields as your driver-guide tells the unique story of the Cajun people. It’s amazing how their odyssey brought them to settle here in South Eastern Louisiana! Climb aboard for a narrated tour of a Cajun Bayou (about one & a half hours) in a covered pontoon boat. The winding bayous of our remote cypress swamp will awe and inspire you. The “Bayou Boeuf” area offers some of the most spectacular wetlands scenery of all Louisiana’s swamps, marshes, and bottomlands. Your Cajun pontoon boat captain is also a fifth-generation professional alligator hunter and fur trapper. He has carved a living out of the area’s swamps, lakes, and bayous since boyhood. With unsurpassed knowledge, he’s taught his three sons the art of making a living within their traditional Cajun Culture. He loves to share his knowledge of his swamp with his guests! You will learn about reptile habits and healing plants. Watch for dangerous snakes and spiders that hide out of sight, and exotic birds too! After this slow and peaceful ride, explore his picturesque swamp zoo on Bayou Boeuf.